We found all of the decorations. Then we bought a few more. We boxed up hundreds of prints and giftware pieces, loaded them in the van, and brought them downtown. All day long, we hung paintings, filled up my displays, and made sure everything was in place. Why all the hard work? Because today is Day 1 of 38 days of holiday cheer at the annual Holiday Market in Market Square! The soft opening tonight (Thursday, November 15th) is mostly unadvertised. It’s sort of a dry run to make sure everything is in working order and the lights and decorations are ready for Light-Up Night on Friday (and of course for every day and every night after that until December 23rd). Not many people know about the soft opening, so it won’t be nearly as busy as it will be tomorrow on Light-Up Night. Today’s your chance to enjoy the Holiday Market without the crazy Light-Up Night crowds that will be downtown on Friday. That’s right – everything that is in my chalet today is 15% off! Not in town? Not a problem! I’m offering Free Shipping today for online orders. The banner is waiting for you on the main page of my website – check it out at www.lindabarnicott.com. Better hurry though – the free shipping offer ends at midnight on Thursday, November 15th. I’d be happy to help you with your holiday shopping list. Hope to see or hear from you soon! P.S. 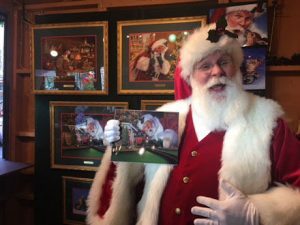 – If you think Santa looks excited about the Holiday Market, you should see Aria. 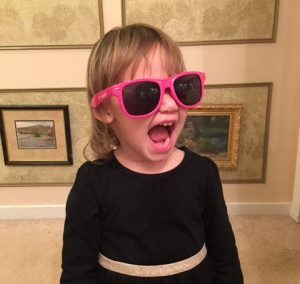 She is all dressed up in her pink sunglasses to come downtown and visit Grandma’s chalet! P.P.S. 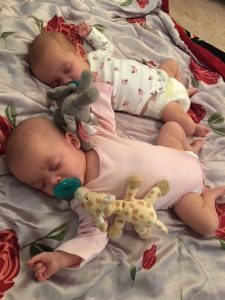 – Abigail and Autumn Update: Both babies are thriving and are still totally adorable in my completely unbiased opinion. ‹ Ready or Not… Here Come the Holidays!